I've had a couple of questions from you wonderfully inquisitive (fantastic, gorgeous and absolutely fabulous) readers about the method I use to prepare powder for pressing. 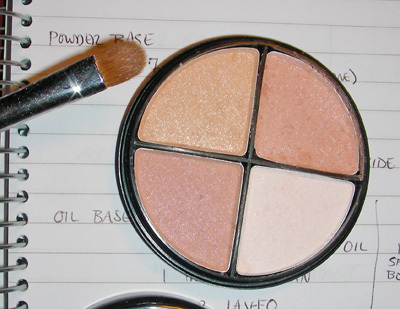 Here's how I put together a palette with highlighter, foundation and blush tones the other day. Tip: Don't try to do everything in one session. 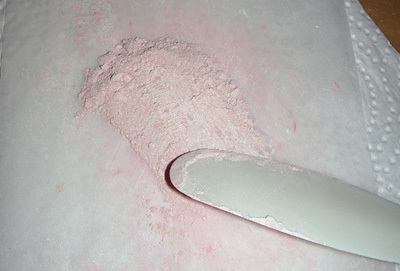 Preparing base powder and binder can be done in a one session. Mixing color pigments is another session. (When I start mixing colors, I invariably enter a time warp and suddenly discover 3 hours will have somehow mysteriously disappeared in the wink of an eye). 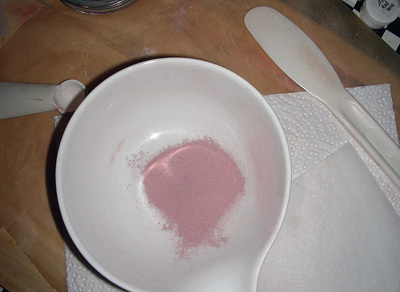 Mix base powder with your desired color and sift together several times until the color is even. 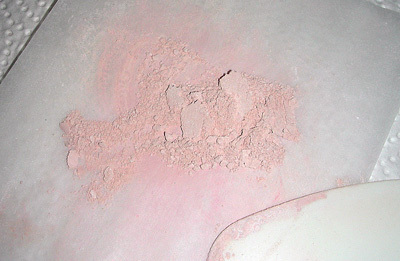 The proportion of base powder to color is dependent upon the components of the base powder you are using. (see below for a link to other posts on base powder). For this blush color, I used 40% base powder to 60% color. 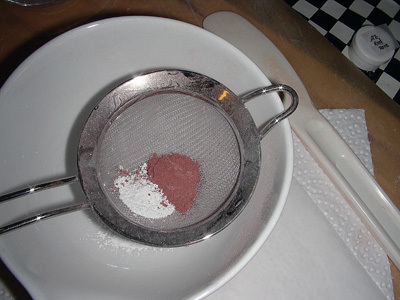 The color of the sifted mixture is 'softened' due to the titanium dioxide in the base powder mix. This results in an opaque color (with added sunscreen effect). A base powder mix without zinc oxide or titanium dioxide will result in a more transparent color. 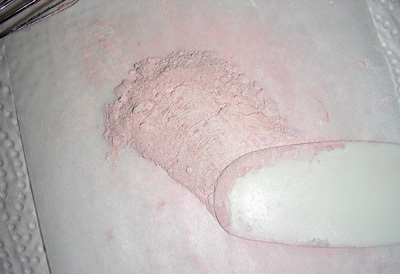 Even though the sifted color looks a far cry from the original tone, introducing binder to the mix will make a bit of magic happen and this blush color is going to regain most of its original strength (see bottommost pan in the pic at the bottom of this post for the final result). Some use silicones as binders, but I prefer plant-based products and make a mixture of jojoba and fractionated coconut oil with E-vitamin as an antioxidant. I normally make enough for several pans of color so I have binder 'at the ready' for spontaneous powder-pressing occasions (Springtime is usually full of these). A spray bottle is the ideal vehicle for delivering a light, even layer of oil. Tip: Make a healthy amount of everything for your very first portion and expect to use a bit of time experimenting with the binder-to-powder ratio to get the texture right. You may very well need to throw some product out along the way. However, if you keep notes, it will be a piece of cake to recreate the perfect proportions. For example: it took me 4 tries (in a previous session) to find that this particular pan size requires one and a half spritz of binder per pan. Working the oil into the powder is best done with a stiff spatula. Pull and drag it along the paper (kind of like buttering a piece of bread), scrape the color together and keep 'buttering' for 3-4 minutes. When you see small lumps forming and the color changing back to its original hue, start testing for 'press-readiness'. Scrape the mixture together on the paper. Press down on it with the spatula. When it readily hangs together in large-ish lumps, it's ready for pressing. If it just as easily breaks up again, you have achieved the perfect binder-to-powder ratio. Tip: Don't be tempted to press before you can feel and see that the binder is evenly and completely distributed. Your pressed powder will reward you by staying in the pan and behaving ever so nicely – even if you accidentally drop it. 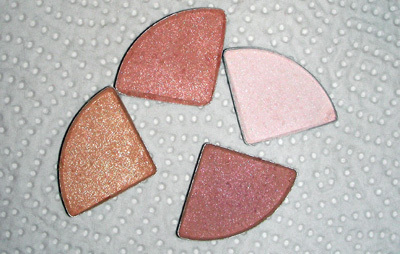 Here are the 4 pressed pans I did for my face-sculpting, skin-tone palette. The end result is pictured at the beginning of this post. You Can Totally Do This Too! Despite this detailed (and hopefully not too daunting) description, it took a total of an hour to create this palette of 4 colors. "But how are they to use, Lise?" I hear you asking. They go on like a dream, feel like silk, have great staying power, are easily removed, and look like a million – they're pure pleasure! Now, go make your own, and have fun with it! 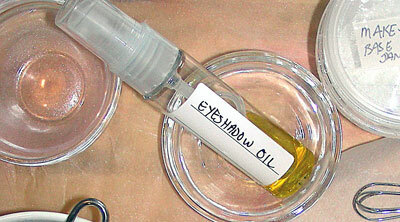 To see how I press eyeshadow, please visit this post. To read a bit about base powders and mixing a powder foundation, please visit this post. Do you press your own powder? Which method do you use? What are your proportions in your homemade liquid binder? Where do you find the ingredients? Is the "e-vitamin" already part of the fractionated coconut oil, or do you add it, and where do you purchase it? I LOVE the idea of a completely plant-based, more natural liquid binder, with out silicones- this is the first one I've seen and would love to follow your recipe! The proportions can be played with to your liking, but I started with a 50/50 mix of the jojoba and fractionated coconut oil and played a bit with the proportions until i found what I liked best. The e-vitamin is added as a rancidity retardant - a drop or 2 to 50ml. Use the mixture within a year. Supplies: Check the links on the right menu. I am in Europe and these are all in Europe, but if you are in the US, check out Rose Mountain Herbs or (I think it's called) Voyager for supplies. Best of luck with it and please do let me know how it works out for you! I am currently working on pressing foundation and blush. I am working on a formula to add my color to that is pressable, this seems a bit tricky. I too am using only plant based binders of caprylic/capric triglyceride and avocado oil. I am not sure how much I need to add to my powders though... I imagine too much will make it too hard and unable to brush pigment off onto a brush. Do you have a good eye for how much binder to use? Hi Ashlyn -- you need much less oil than you might imagine. Under 10% of the mix should be oil. Thank you! After some more research and reading I found that it really doesn't require much powder. I will be giving this a go tonight with foundation! Thank you! After some more research and reading I found too that it really doesn't require much powder. I will be giving this a go tonight with foundation! Will the eyeshadow itself go rancid after a year or just the mixture? Hello, I was wondering where you get your compacts and pans? I looked in your packaging tag but didn't see any mention, perhaps I was looking in the wrong place. Thanks for any help. Hi Savannah - you still need base powder with a highlighter - otherwise it won't stay where it is applied. A base powder - depending on which powders you are using - should not afffect the reflectiveness of the mica. Best of luck with it! Thank you so much! I am going to try your recipe for your liquid binder! Will I just need to combine the jojoba, fractionated coconut, and vitamin E oil together? Not sure on the proportions of each ingredient for your liquid binder. What a wonderful blog!! 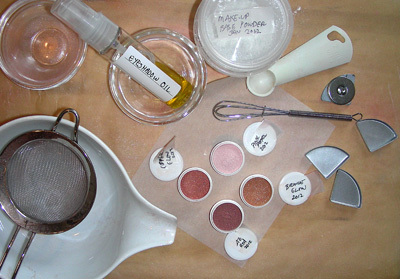 Discovered it/you a few weeks ago as I was scouring the web, and figuring out how to take my solution to my very pinkish/rosacea-prone skin (applying loose green clay) to the next level (making a pressed powder). For now, I've just added arrowroot powder to the mixture. Wow! it already feels much silkier and seems to last longer. Quick question: is there a minimum amount/proportion (if that makes any sense) of arrowroot I must use or is the amount only dependent on the translucency/opacity I want? My skin is pinkish enough as it is, and I found that the green clay alone toned it way down. And maybe there is another reason to have a minimum amount of arrowroot in the mixture to (I'm making things up here) keep the clay from binding to my sweat or something? Hi Laura - thanks for your kind words! There isn't really a minimum amount for arrowroot in a powder cosmetic. I would do up a few small batches and see what works best for your needs. Maybe 2-3 batches with 5% increments, so batch 1 has 5%, batch 2 has 10%, etc. You may find your ideal proportion is something in between batch 2 and 3. Best of luck with it!